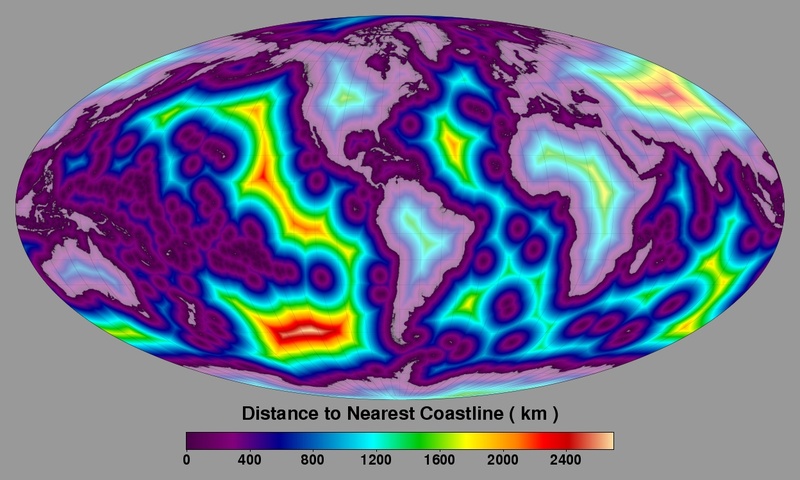 In June of 2009, we of NASA's Ocean Biology Processing Group pressed our computer hardware into the service of generating a global data set of distances from the nearest coastline. Creation of the data set had been advocated by Rick Stumpf of NOAA's National Ocean Service while he was on assignment here at NASA / Goddard Space Flight Center. The new data set would be useful for generating coastal level-2 and level-3 ocean color products among other things. The original concept for producing the data set came from Eric Leuliette of the NOAA Satellite Altimetry Lab. We generated the data set at a global grid increment of 0.04 degrees using the Generic Mapping Tools (GMT) package. The coastline came from a dump of the intermediate database distributed with GMT (pscoast -Di -Rd -W -M). Distances were computed with the GMT grdmath LDIST operator. Rick then interpolated the data to 0.01-degree resolution and saved the data as a GeoTiff image. You can either download the original 0.04-degree data set as a compressed text file with records [longitude latitude distance] (where distance is in kilometers), or you can download the interpolated 0.01-degree GeoTiff packed together with a brief description file. A signed version of the 0.04-degree data set is also available. In this file, negative distances represent locations that are considered to be over land according to the GMT coastline database. Landlocked bodies of water (e.g. the Caspian Sea) are also considered to be land in these data sets. Below is a pictoral representation of the data set.